Please send me a price for the NPP-4840-3R-E3CD-FDA new 48x40 plastic pallet. 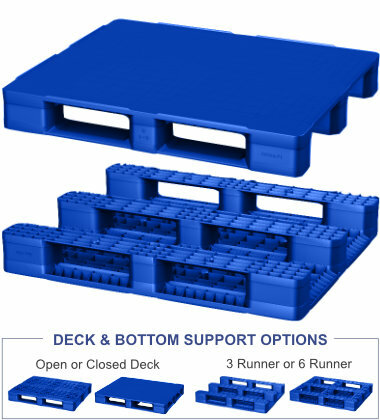 3 runner plastic pallets like the NPP-4840-3R-E3CD-FDA often pair well with edge racking systems. This stackable plastic pallet has a strong 3 runner bottom deck for safe double stacking of multiple plastic pallets with product. This rackable plastic pallet works in warehouse racking systems by using support from the 3 runner style bottom deck. Plastic pallets like the NPP-4840-3R-E3CD-FDA are lightweight and durable. Its uniform length and width provide ease of use and safety. This FDA Approved virgin material plastic pallet meets strict government guidelines to prevent impurity and allow direct food contact. Transport and store frozen foods and other chilled products on the impact-resistant NPP-4840-3R-E3CD-FDA plastic pallet. Keep electronics safe from electrostatic discharge during shipping with anti-static options available on the NPP-4840-3R-E3CD-FDA. Get more turns using the NPP-4840-3R-E3CD-FDA multi-trip plastic pallet and easily win back startup costs with durable and reliable plastic. Use the NPP-4840-3R-E3CD-FDA captive plastic pallet in closed loops to satisfy in-house reusability requirements with the reliability of plastic. Save costs when shipping cargo via air with the NPP-4840-3R-E3CD-FDA air freight plastic pallet. Perfect for single use and one-way air shipment. Supporting 4,400 lbs of dynamic load when moved by a forklift or hand jack, this pallet works well in heavy duty applications. Ideal for closed loops or distribution chains across industry sectors including Electronics, Food, Retail, Medical and Pharmaceutical. Rod Inserts for Increased Performance. Is the NPP-4840-3R-E3CD-FDA the right pallet for you?